If you like rare ahi get the best tuna you can find (and afford). But the sauce makes even the lesser tunas taste delicious. Sunchokes are the same as Jerusalem artichokes. Cheese and eggs can be combined in so many ways.... These are not as light as a soufflé but lighter than a frittata. Butter and line the bottom with buttered wax or parchment paper (see techniques ). Slice or cut cheese to fit into ramekin. Place cheese in bottom of ramekins. Roughly chop Prosciutto and arrange around edges of cheese. Whisk eggs, ricotta, mustard and basil together. Spoon egg mixture into ramekins. Put ramekins into a roasting pan with deep sides - I use a metal bread pan, and add hot water (hot tap water is fine) so that it comes half way up the sides of the ramekins. Bake for 30 minutes at 400F (200C) - they should be set - firm on top and starting to brown. Remove from oven and from hot water. Wash spinach if necessary, spin dry using a salad spinner, tear and put into a large salad bowl. Whisk together vinegar and mustard. Slowly add olive oil, whisking constantly until vinaigrette is thick and creamy. Add spinach and toss well to coat - tongs work well. To finish: Arrange salad on 2 plates. Run a table knife around the sides of the flans to loosen (if necessary). Put a small plate over top of ramekin and flip over. Remove ramekin, and paper from top (formerly bottom) of timbale. Carefully turn back so top is up. 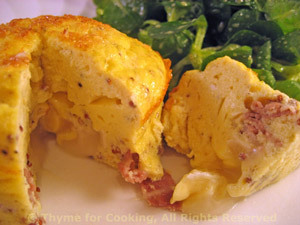 Place flans next to salad and serve. This is best with good sushi-grade tuna that is quickly seared on both sides and cool or just barely warm in the center. If you get regular tuna you will need to cook it until it is closer to medium - well. Ask your fish monger (I love that word)... or the guy behind the counter. Add garlic, fennel seeds and sauté 1 minute. Remove and reserve. Add tuna and sauté 3 - 5 minutes per side (depending on thickness - 3 minutes if 1 inch (2.5 cm), 5 minutes if 2 inch (5 cm)) for medium-rare, longer if you want them more done. Remove and cover with a lid or foil to keep warm. Return fennel and garlic to pan and add rest of ingredients. Bring to a boil and boil 2 minutes. Pour over tuna and serve. Sautéed onions and mushrooms perk up fragrant Basmati rice for a lovely side dish. Make with vegetable stock or water for a vegetarian version. Heat 1 tsp butter in a small skillet. Add stock and herbs, cover and cook rice for length of time on package. Chop onion, mushrooms and mince garlic. Heat remaining 1 tsp of butter and oil in small skillet. Add onion and sauté until tender, about 5 minutes. 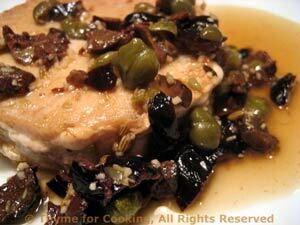 Add garlic and mushrooms and sauté until everything is light brown, about 10 minutes longer. 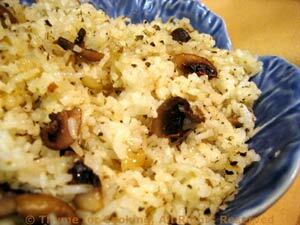 When rice is done, combine with mushroom/onion, fluff with a fork and serve. Another easy way to fix this versatile vegetable. Peel sunchokes using a vegetable peeler or knife if they are really gnarly. 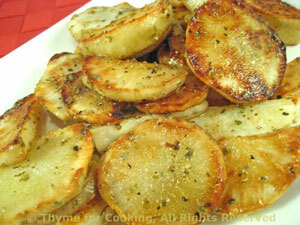 When hot add sunchokes slices and quickly sauté until golden brown and crisp-tender, 7 - 9 minutes. Sprinkle with herbs and sea salt if using and serve. Note: Sunchokes tend to discolor - if not cooking immediately, put in a bowl and coat with the olive oil.